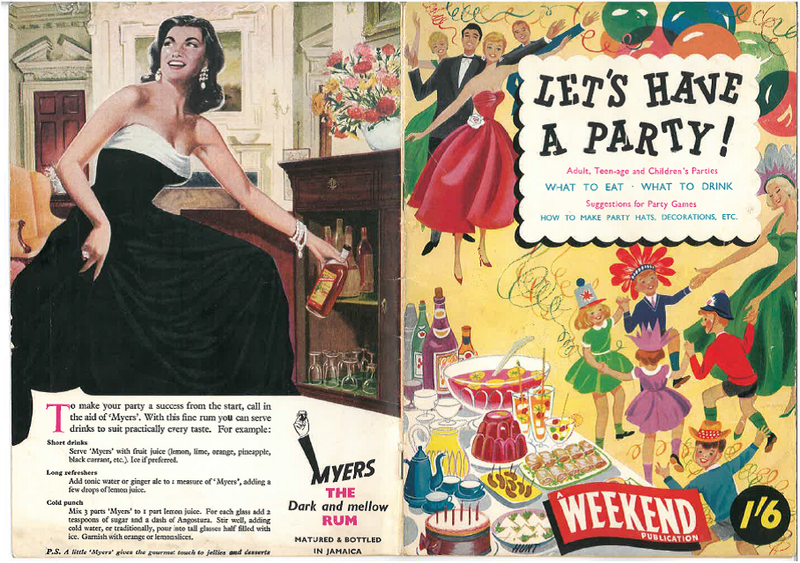 Let’s have a (1950s) party! 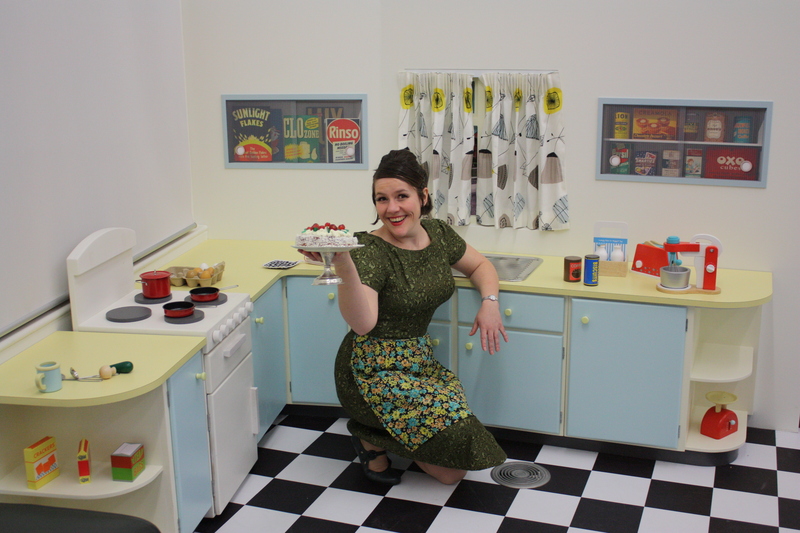 Wakefield Museum has just opened a miniature 1950s kitchen as part of its provision for children’s hands-on learning. It’s rather jolly: all blue formica (ish), with wooden foods and tools, and even a stand mixer. I went over to cook up period food as part of their opening event. The ’50s theme was an interesting one. Until 1954 rationing was still in force, and when it finally ended there seems to have been a sort of collective ‘yippeeeee’, as steak, chips, sweets and exotic fruits went back on the menu. More than that, the influence of America on Britain during the war increased in culinary terms after it, and imports along the lines of fast food and frizzy drinks started to make inroads. I set my party at the very end of the 1950s, so I could take full advantage of all the new foods and preparation methods, and really express the joy of No More Rationing. I’m not really a fan of fitted kitchens, but I could make an exception for this one. The Wakefield collection includes a pamphlet called ‘Let’s Have a Party!’, which I used for some of the recipes. Others came from my own collection, mainly from the hilarious (to modern eyes) Book of Savoury Cooking by Marguerite Patten. I was given this by a friend, and we planned to do a whole meal from it – except we couldn’t find anything we fancied eating. I have to say, we were wrong. Now I’ve cooked from it, I hang my head in shame. What was I thinking, rejecting marmite and pineapple sandwiches? Honestly, it’s one of those books wherein the recipes don’t sound great, but some, at least, are. (A build from this came via one of my twitter followers, who put cheese and pineapple on TWIGLETS. That is a piece of historically-inspired genius, right there). Let us party indeed! Best named recipe? Orange Orgies. The late ’50s was an era where women’s ideal was still to give up work on marriage, or at least on having children, and keep a perfect house for their brill-creamed husband. Labour-saving devices, electric hoovers, stand mixers and the like, came in. Fridges started to achieve household penetration (sales rocketed after tax was halved and hire purchase restrictions lifted in 1958 – up to that point around 10% of households had one). Gadgets galore! The main gadget I made use of was a tin opener. Literally everything I cooked used processed goods in one form of another. It was an eye opener vs even 1930s food. 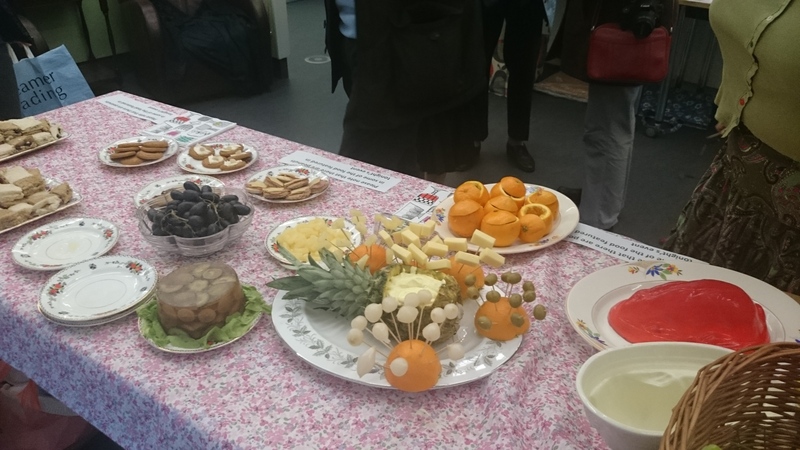 There was a real sense of verve and determination to showcase processed foods as being glamourous, easy and fun. Ready sliced cheese was all over our canapés, Marshmallow fluff provided the filling for a cake, bought silver balls were rolling all over the tables. The food for my party was showy, exotic and had a touch of humour about its presentation. Hollowed our pineapple filled with mayonnaise and mustard with dips of various kinds. Jelly. Canapés. Sandwiches. My favourite, incidentally, was salami, ready sliced cheese and peanut butter. No, really – compelling…. Prawns in aspic. Stunning, I suspect, in its Victorian hey-day. 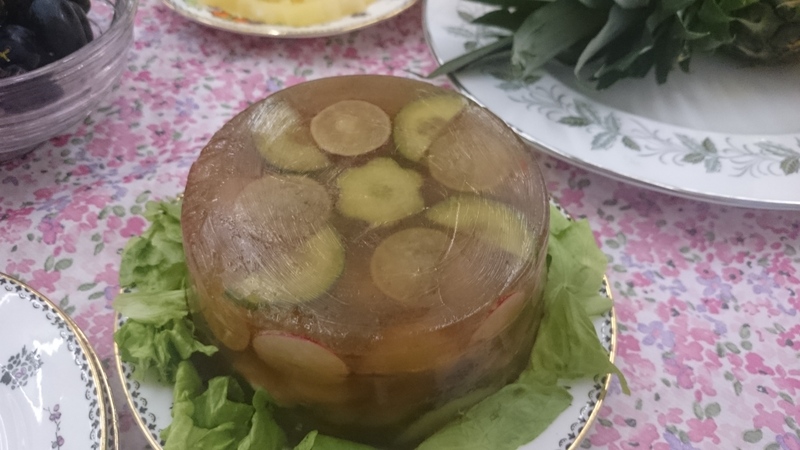 ’50s style, with frozen pink bits of horrible goo and bought aspic, meh. Traditional cooking did suffer, undoubtedly, when filtered through the era of The Tin. Modern food commentary tends to demonise processed foods, and tins, and sugar, and imports. Cook fresh! Cook local! All well and good, but let’s not forget that when these things first came in, they were a mini-revolution. They freed up women’s time, preparing the ground for the vast leaps forward in women’s rights in the west which came in the decades after. They were a joy, after 14 years of monotonous food restrictions. They were of their time, yes, and possibly some of them should stay there, but I think from time to time I might just unleash my inner 50’s cook, because, from a food perspective, it was a DELIGHT! 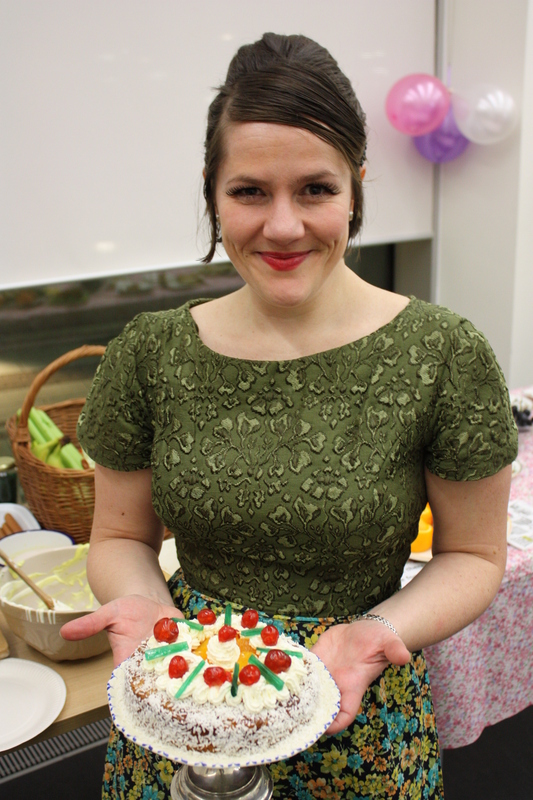 Me, feeling the joy, with a hollowed out sponge cake filled with tinned fruit and cream.